Update (February 6th, 2018): Acumatica is now going after Sage Timberline with an Acumatica Construction Edition. Click here for more info. Big Update (July 25th, 2017): Sage acquires Intacct. My thoughts on how this changes the Sage vs. Acumatica debate (click here). Note: This post pertains to Mid Market ERP Software. “Mid Market” can roughly be defined as companies with annual revenue of 10 million on the low end to around 700 million on the high end. Sage’s strategy is aimed at the SMB space (Small and Medium Businesses). This post is focused on the MB (Medium Businesses) portion of the Sage strategy which is serviced by their Sage 100, Sage 300, and Sage 500 products. Acumatica focuses exclusively on Medium Businesses with one product called “Acumatica”. For the past several years, the Mid Market ERP Software space was largely abandoned by the traditional players. Microsoft Dynamics had shifted their resources to focus on larger companies, NetSuite was also chasing larger deals, and Sage was adrift without any coherent strategy for the future. Acumatica took advantage of this situation and rapidly gained a noticeable presence in the world of Mid Market ERP Software. Acumatica is 100% focused on this space, with only one product, and their product is aimed at Medium Sized Businesses. However, last week Sage put on a very impressive summit in New Orleans that generated a lot of buzz, signaling that the Mid Market ERP Software battleground is not going to remain uncontested any longer. 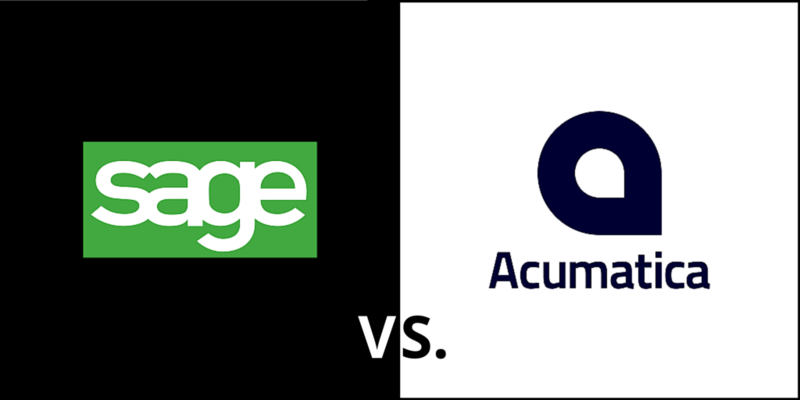 People are excited about Sage again and we have a competition that is shaping up to be a David vs. Goliath affair between Acumatica and Sage. Sage is a 2 billion dollar organization, the 3rd largest ERP software company in the world behind SAP and Oracle. But their organizational structure is complicated by a large portfolio of disparate products (many from the 1980s) that are only unified by the Sage marketing brand. It’s no accident that Sage tapped Stephen Kelly as their new CEO, a man with strong government background, most recently serving as Chief Operating Officer for UK Government. But Government is hardly known for innovation, more often known for red tape. Acumatica, on the other hand, has a razor-sharp focus on Mid Market ERP Software with one product that was developed from scratch in 2008. The Acumatica company goal is very straightforward and they don’t have to employ a team of diplomats in order to deal with the constant squabbling between internal competing factions. Sage invests their profits primarily in marketing and they are famous for continuously re-branding existing products, initiating more name changes than I can count. Their most recent product was already re-branded from “Sage Life” to “Sage Live” last week before it even launched. This kind of BOTOX treatment attempts to achieve a fresh look without addressing the underlying problems of an aging product line that continue to loom like an underwater iceberg in the way of an approaching Titanic. Last week at Sage Summit, it was announced that they will be dropping “ERP” from the names of all their products, another marketing “magic trick” that attempts to conjure up innovation out of thin air. Acumatica, on the other hand, invests primarily in developing their product and not in marketing. This “long term” strategy is beginning to gain momentum, especially among ERP implementation consulting companies (both Sage and Acumatica sell through consulting companies). In the recent annual report of the largest Mid Market ERP consulting companies, Acumatica was the most popular portfolio addition. This “grass roots” marketing strategy is very popular among Millennials who are increasingly occupying the decision-making positions in organizations. Millennials rely heavily on user opinions, not marketing, to make their decisions. And Social Media, Amazon Reviews, and “Googling” have made this kind of decision-making a lot easier. I personally think that the grassroots “let your product do the talking” strategy bodes well for Acumatica. Everyone knows that enterprise mobility is a major trend that is only going to continue to grow. Mobile development teams are typically composed of younger, brighter talent, and most new software developers want to do mobile because of its popularity. Sage’s mobile strategy takes the traditional approach with a separate team that builds stand-alone companion apps. The problem with this approach is that the mobile development is a separate effort that is really a completely separate application. We have seen this play out with many other software products that add a companion mobile app. The mobile app starts out with a small subset of functionality (a small circle within the circle of the main companion software product). But, as time goes on, the young, aggressive mobile development team makes the mobile app start do things that the main companion software product doesn’t do, or it does those things in a better way (a small circle that overlaps with the circle of the main companion software product, but is not fully contained within it). The result is that the mobile apps become entirely new products. This is the case with the Sage mobile apps. They are entirely new products within the already cluttered Sage product portfolio. Sage wants to be the sole provider of enterprise software to their customers with a focus on what they call the “golden triangle”: Accounting, Payroll, and Payments. In order to support this philosophy, Sage has always employed an acquisition strategy, with a former UK CEO saying that “Acquisitions are part of our DNA”. The problem with this strategy was that the underlying technology looked nothing like what one would expect when using multiple applications under the one Sage brand. It quickly became apparent to the consultants implementing the software that integrating multiple Sage products was no different than integrating products from entirely different vendors. However, this strategy seemed to work before the advent of Web Applications because ALL enterprise software was siloed and building integrations was just part of the known pain associated with implementing ERP. Things have changed dramatically with Web Applications like Acumatica. Web APIs allow simple, robust communication to take place between applications without having to do extensive programming. This allows companies to simply “plug in” to the best software for each area of their business, ensuring that they get the best functionality in each area. This is how the new “connected world” works in the software industry. Even Microsoft has recognized this under its new CEO Satya Nadella by forging a dizzying array of new partnerships that allow Microsoft to continue to compete in the new Web Application landscape. Acumatica has employed this strategy from day one. For example, rather than build their own document storage software, Acumatica allows you to choose whether to store the files on your own network, with an industry-leading SaaS solution like Box.com, or with a customized solution. The point is that Acumatica is designed to work with whatever you choose. Maybe you want to use WordPress to build your customer facing website, ADP to process your payroll, Oanda to retrieve exchange rates, Power BI to provide Business Intelligence reporting capabilities, or PayPal to process your payments. Acumatica uses the “team” approach, assuming a role on your enterprise software team, not trying to be a “ball hog” that runs the entire show. Sage CEO Stephen Kelly made the announcement last week that Sage is going to continue to support their current On-Premise customers without forcing them into Cloud solutions. This was a no brainier in my opinion because the entire Sage customer base is On-Premise with Cloud being something that Sage is only recently dabbling in. To abandon On-Premise would have been to close the doors of the Sage organization. Just like with their mobile apps, Sage’s Cloud foray is an entirely separate endeavor, an add-on that remains distinct from their current products. They have no other choice because of the way the technology works. Legacy On-Premise products cannot simple be “cloud enabled”. You basically have to re-write them from scratch to make them Web Applications that you can use in your Web Browser. Web Applications like Acumatica, on the other hand, can be easily deployed in the Cloud or On-Premise with the click of a button. Acumatica was built from scratch in 2008 on modern technology as a Web Application from the very start. With Acumatica, the Web Browser was the client from day 1, there never was a Desktop client like you have with the old On-Premise Client/Server ERP products. Web Applications can just as easily be deployed On-Premise or in the Cloud, depending on what you choose to do. Although ERP vendors like NetSuite don’t allow you to use their product On-Premise for legal reasons, Acumatica has no problem with On-Premise which makes them very unique in the world of Mid Market ERP. The result is the same exact product, just one Acumatica product, for On-Premise and Cloud customers. Cloud and On-Premise are not two separate worlds for Acumatica like they are with Sage. In this Sage vs. Acumatica competition, there is one thing heavily in Sage’s favor and that is Sage Summit. This annual event is a HUGE draw for SMBs and it provides a platform for Sage to promote their products. However, the problem with Sage Summit is that it is primarily an SMB thought leadership and networking event, not a Sage product event. Sage Summit is mainly known for its impressive list of guest speakers and after parties where like-minded professionals get to network. The main “software” value delivered by Sage Summit takes place on the expo floor. But the expo floor is increasingly made up of 3rd party software providers and consulting companies that also now represent Acumatica. If I were Acumatica, I would recommend that customers attend Sage Summit because less than 10% of the value derived from Summit actually pertains to Sage products. The other 90% of the value can apply just as easily to Acumatica customers. The next 5-10 years are going to be very interesting in Mid Market ERP Software. 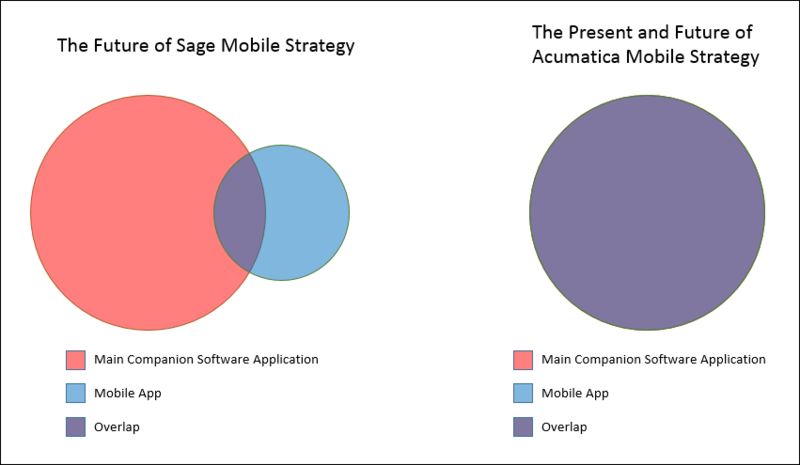 Sage and Acumatica have emerged as the major players and it will be interesting to see how this competition progresses. It’s definitely an uphill battle for Acumatica, but I like their chances. Update 08/18/2015 – This post prompted a response from Walter Goodfield on the blog of one of the largest Sage partners in the United States, RKL eSolutions. Checkout his post, including the comments on the bottom. He has some good points.